Discover the beautiful countryside of the Tarn-et-Garonne! 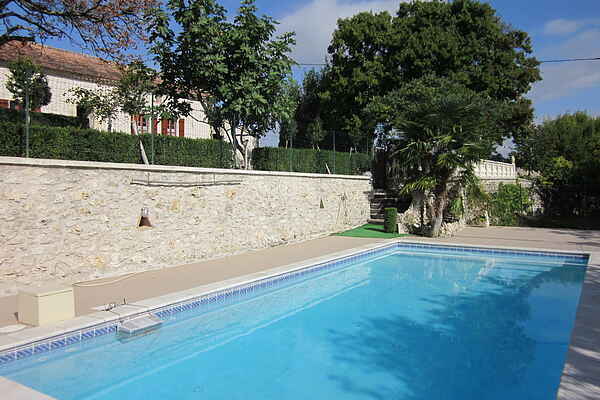 A comfortable holiday residence with an authentic pigeonnier, a mini-golf course, a lovely, fenced pool - and you will have all of this to yourself! The residence's neat and tidy interior will guarantee your stay will be a wonderful one, both indoors and out! Enjoy a cool drink on the terrace. The barbecue provided will make for a culinary evening! This holiday home is the perfect place to start your bicycle rides and long walks along the famous pilgrim route of Santiago de Compostella. It's only a short walk to the medieval Bastide Laureate (6 km) where you will be able to enjoy the sights of the Place du Marché with its arches and white half-timbered houses. Near the small towns of Montage-de-Quercy (10 km) and Montcuq (8 km), you will find two swimming lakes with sandy beaches and a little restaurant where you can enjoy a lovely swim, go fishing, canoeing, horseback riding or play a game of tennis. A true gem that you won't want to miss is Moissac (25 km) with its beautiful Abbey and monasteries. Moissac is located on the right bank of the river Tarn, 4 km before its estuary in the Garonne and on the Canal latéral à la Garonne that crosses the Tarn with an impressive aqueduct.